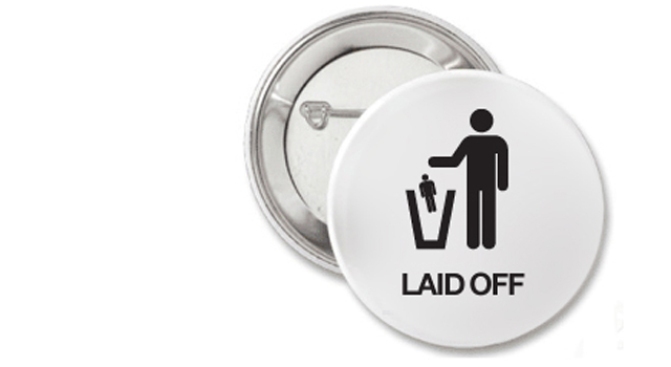 PINK SLIPPED: Happily unemployed and want to brag about it? Or just looking for a networking ice-breaker to land your next gig? Irina Blok's Funemployed buttons (with sayings like "On Paycation," "I Watch TV All Day" and the less subtle "Hire Me!") will accomplish these goals and more; order them for the broke-friendly price of $2. (Also? She can print your resume on a t-shirt. Just email her.) Order here. TEES FOR PENNIES: 'Til now, if we wanted to score huge discounts on American Apparel merch, we stalked street festivals in hopes of finding one of those "irregular tees" stalls. But at Am-App's rummage sale, prices are as low as $5 a pop. Coming up, rummages are scheduled in Carroll Gardens, Wlliamsburg and the Lower East Side -- details here. THREEFER: This week at Clothingline, get your mitts on shoes by Kenneth Cole for just $40 a pair -- or three for $99. Footwear for ladies and gents are in the sample sale mix. (Also on hand are shoes by Gentle Souls around $60 a pair). Through Thursday 6/25 at 261 West 36th Street at Seventh Avenue, no phone.